These rhetoric quotes helped him get applause from the audience; however, today, workers in Information Technology industry are experiencing uncertainty because of a layoff program initiated by the top management in the industry. 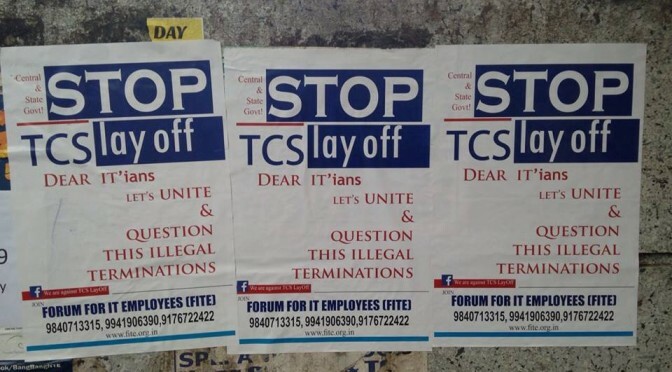 The following article is regarding the layoff issue in IT Industry, especially in Tata Consultancy Services (TCS) and written by Raj (name changed), an IT industry employee. The issue got attention after the press release on December 10th from TCS regarding work force optimization. Though they released the statement regarding work force optimization, many consider this as a lay off statement. The worker’s worries aggravated when some of the senior employees with experience of 10 years and more were asked to leave TCS, and the worries turned into a panic as news about nearly 25000-35000 people may be asked to leave TCS within next three months. It is approximately 10 % of TCS workforce. Because of the high numbers, it got attention in the press and the social media. TCS refutes the claim of mass layoff and stated that involuntary exits would be around 1% – 2%. The total workforce of TCS is little above 3 Lakh. Even 1% – 2 % means numbers will be around 3000-6000 workers. It is also a huge number as one in 50-100 employees are asked to leave the company involuntarily. The affected employees will be left in a precarious position as layoff is being implemented in the last quarter of the financial year. The job prospects will be very less in this quarter compared to other quarters. The company’s planned its layoff program to near perfection as this is being implemented at a time when the appraisal process is happening and many employees will be forced not to speak up against the management as this will affect their promotions, salary hike etc. Not an Open Process at all! The decisions were taken behind the closed door without announcing the exact criteria for termination of job. The most affected people will be women employees as they would have taken more leaves because of maternity, children, etc., and their performance appraisal will not be on par with men in the company down the years. TCS employs nearly one lakh women employees which account almost 70% of total women workforce across TATA group. However, in a sign that shows that women IT workers are not willing to bow down without a fight, one of TCS women employee challenged TCS in a petition at the Madras High Court. TCS has now revoked the termination notice citing pregnancy of the petitioner and that it goes against company’s ethical policy. As for the rest, such grand-sounding ‘Tata Ethics’ do not apply! Tata Consultancy Services is considered as the crown in the TATA group. The market capitalization (the current market value) of TCS is closely $79 billion. The promoters i.e., Tata sons and institutional investors hold 73% and 21 % of shares respectively. The company’s share holders worth tripled between 2010 and 2014. Their net worth increased from 15,016.62 crores to 44,051.88 crores. TCS net profit is nearly Rs. 1660 crores per month in this financial year 2014-15. Considering 3 lakh employees working in TCS, the profit per employee per month is nearly 53,000 rupees. It indicates that one TCS worker already generated 4,50,000 rupees as profit in latest nine months. The profit or productivity per employee increased from 4.6 lakhs per annum in 2013 to 6.3 lakhs in 2014. From this, it clearly indicates that the motive behind layoff is profit not performance (more work/ productivity from less amount of labour). The layoff is going on not only in TCS, but also continuing in other companies namely Cisco, IBM and HP. Yahoo already sacked nearly 2000 employees earlier this year. In order to prevent lay off and to protect the worker rights, many organizations, mainly Forum for IT Employees (F.I.T.E. ), Young Tamil Nadu Movement (YTM) are trying to organize IT workers and protest against TCS. They have started a face book page We are against TCS LayOff to raise issues such as unionization, ways to protect the jobs through legal means and to fight against the layoff. Predictably, not to be totally sidelined, CPI(M) linked CITU, the CPI-linked AITUC and Congress-linked INTUC have also stepped to show their half baked support. In the Indian constitution under Directive Principles of State Policy (Part IV), Article 43 A states that ” The State shall take steps, by suitable legislation or in any other way, to secure the participation of workers in the management of undertakings, establishments or other organizations engaged in any industry”. In real practices neither the central nor the state governments have taken any such steps to ensure participation of workers in management decisions of any industry or implement labour laws. The centre and state governments are promoting Special Economic Zones to woo IT players to set up their companies in their state. Apart from land, electricity and tax incentives to the industrialist, the major incentives they provide to these MNC are the modifications in the labour laws. For example, the economic activity within a SEZ is considered as a ‘public utility service’ under which Indian law makes strikes entirely illegal! The BJP led central government advertising and promoting “Make in India” where IT services is one of the five core sectors. 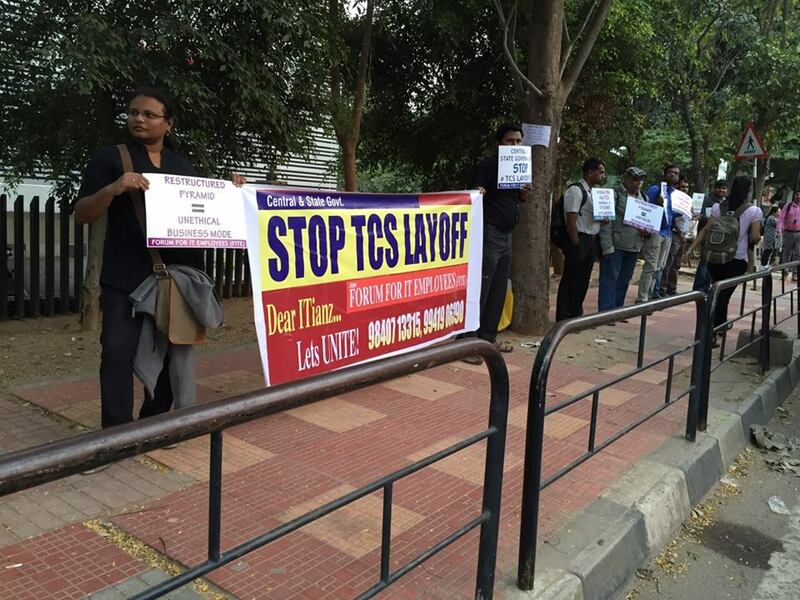 However, the central government is silent regarding the layoff of IT workers in TCS, one of the leading IT service company in the country. No effort from government side to prevent the mass lay off happening in TCS. It shows the actual concerns behind “Make in India” campaigns are about industrialist/ investments and not the actual makers i.e., workers themselves!. New Socialist Alternative (CWI-India) has participated in protests organized by FITE in Bangalore. 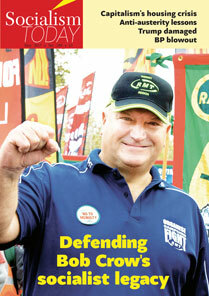 We have also spoken on the need for democratic unionization of IT workers in many of our campaign leaflets. This is the only way forward for the IT workers to fight for better working conditions and also to win the fundamental rights of Trade Unions to organise in their workplaces and strike if need be. Only this way can the IT youth can gel their social weight within the society and strive along with other radical sections who are fighting to establish a system of social equality, with out any form of oppression based on class, caste, gender,sexuality nationality, language and religion. i.e., Democratic Socialism. Previous PostHindutva Attack on ScienceNext PostGreece: Why did Syriza and the KKE fail to reach agreement? But why is it that a business is obligated to keep someone who they do not need? I am very curious on your veiwpoint.